Year 4 of ownership has now passed by in my 2014 Nissan Leaf SL electric vehicle (EV). This post is one in a series, the rest of which can be found at Cost Info Posts. Note that all costs are in $CDN. 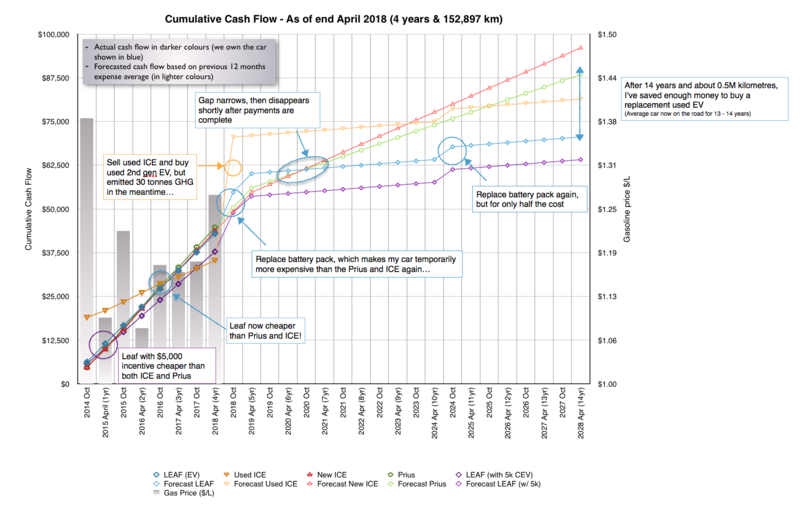 I’ve included a summary of costs over the 4 years. Further down you will find my usual detailed 6 month interval update, and below that any tidbits of news or information I found interesting from roughly the fall of 2017 to the spring of 2018. If you find this information of value, please consider a small donation via Patreon. Cheers! Over those 4 years, I’ve avoided emitting 27 tonnes of CO2, and approximately 60 kg of nitrous oxides, and 90kg of volatile organic carbons (some of which are known carcinogens). There are also a smorgasbord of other pollutants, check out the BC Ministry of Environment website for more. Air quality has a large impact on human health in urban areas, so aside from the GHG, there are many other good reasons to get out of petrol vehicles! There really wasn’t much of interest during this time frame that impacted cost. At the very tail end, gas costs went up quite a bit, which will likely start to show an impact in my savings rate for the upcoming 6 months! 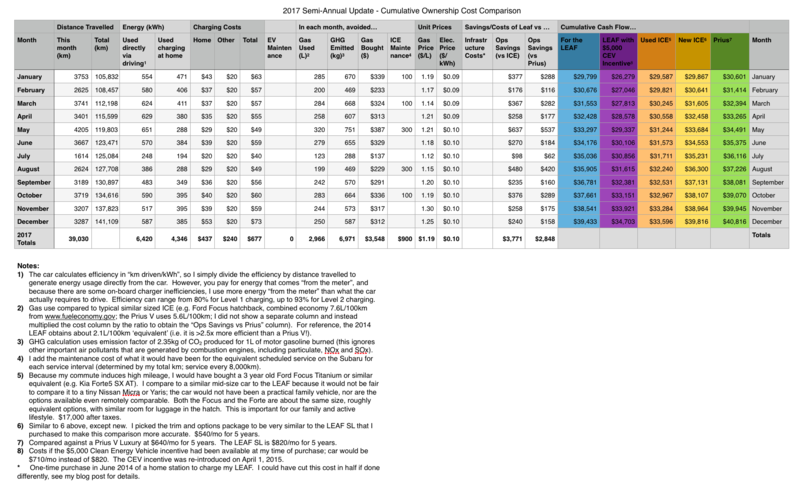 You’ll note that the price of getting into a used 2nd generation EV is higher then I had predicted it would be for the last few years; that’s because only the Chevrolet Bolt has been available for over 1 year now (where I thought a few years ago that there would be at least a few others), and the Bolt had a pretty high initial selling price in Canada (used ones are still high 30’s); so luckily for me, I made the right choice to get an EV when I did! At the end of 14 years, I will have saved enough money to purchase a replacement EV! So for these various reasons, I don’t think I’ll replace the battery in our Leaf. I am more likely to get a second EV and switch to commuting in that car, at least during the winter when the extra range would be helpful. 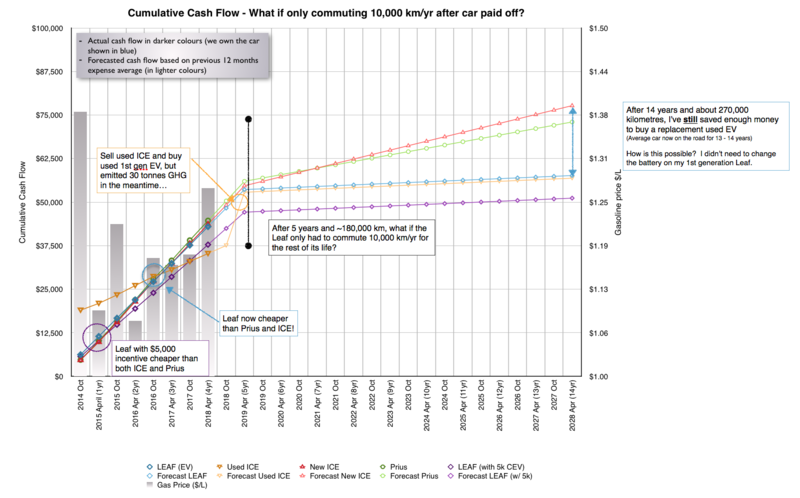 So with that in mind, I thought what would the cost chart look like if I “retired” the Leaf from doing the long commute each day? Retirement would mean it would get driven around the Nelson area each day instead (by my wife shuttling kids to school and off to work), and probably only accumulate 10,000 km per year. At that rate, we would never replace the battery! Canada sales for 2017: battery electric vehicle sales almost doubled from 2016 to ~ 10,000 units. The market for BEV/PHEVs went up almost 70%. Canada sales for Q1 2018: holy smokes, electric vehicles are at almost 5% marketshare of new passenger cars! (Which is basically the only market segment they exist in right now in any number.) Sales are up 75% from Q1 2017. Yes folks, they are selling in more and more numbers all the time. Your next vehicle is likely to be electrified in some way! With the new chargers, I’ve been able to go to Red for a day of skiing, and we now head to Salmo each weekend so the entire family can enjoy learning how to ride and race BMX bikes! AWD EVs are coming, finally! Audi has introduced the pre-production e-tron quattro (a lifted station wagon, drool!) and will show the production version at the end of August, going on sale in Europe by the end of 2018. We should see it by mid-2019. Jaguar has released the i-Pace in Europe, which should also come here soon. Both of these are upmarket though. Volvo is supposed to release an electric XC40 in 2019. The Tesla Model 3 will be available with AWD fairly soon, and Tesla has also been hinting at the Model Y, saying they will unveil the concept version in March 2019, aiming for production 18 months later (pretty ambitious). We still don’t have any in the truly affordable range ($30k range, e.g. RAV4, Forester, Santa Fe, etc) though, and likely won’t until 2020 or 2021. Hi Andrew. My husband and I just bought the Mitsubishi Outlander PHEV AWD. We are super excited. We never buy new cars so this was a calculated leap. Nothing like apocalyptic fires to spur a family into action. Hi Sandy, hope you both enjoy the new vehicle! There seems to be a lot of excited owners on the “Canadian EV Owners” Facebook page. Cheers! Hi Andrew. Thanks for this site. 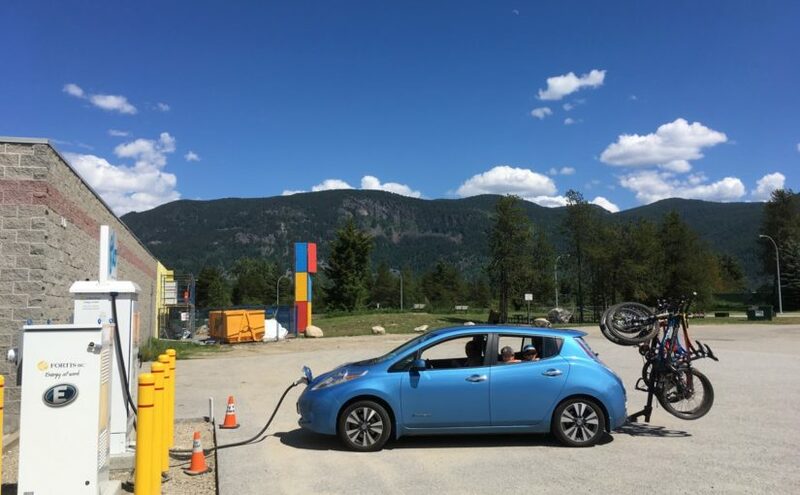 I only recently discovered it, but was intrigued to see what looks like a North Shore bike rack on the hitch of your Leaf in this post. 2 questions.. 1, how does the leaf drive with a 4 bikes on the back, and 2, are you considering using the same rack on your new Model 3? Congrats on that and good luck on your journey. Hi Jeff! That is indeed a NSR on the Leaf with 4 bikes – all around the 30lb mark. Puts a total of about 170lbs on the rear of the Leaf – surprisingly it holds the weight up pretty well. It doesn’t feel overloaded or mushy. We then put all of us in the car and drive around in it no problem. You do notice the weight going over humps in the highway etc, but it hasn’t been scary at all. And yes, I have a second NSR sitting in my carport waiting for spring to come – I have a Stealth hitch on order for the Model 3, and once that is mounted, I’ll have the NSR on probably from April through October. I’ll definitely post updates on how that goes.